Go into any gym at the beginning of a New Year and the place will be packed. Check back three months later and it will look mostly deserted with just a few scatterings of people exercising here and there. Everyone has good intentions when they start a new exercise regimen. The main goal is usually to lose some weight, get in better shape, improve cardiovascular fitness or bulk up, or define and tone muscles. 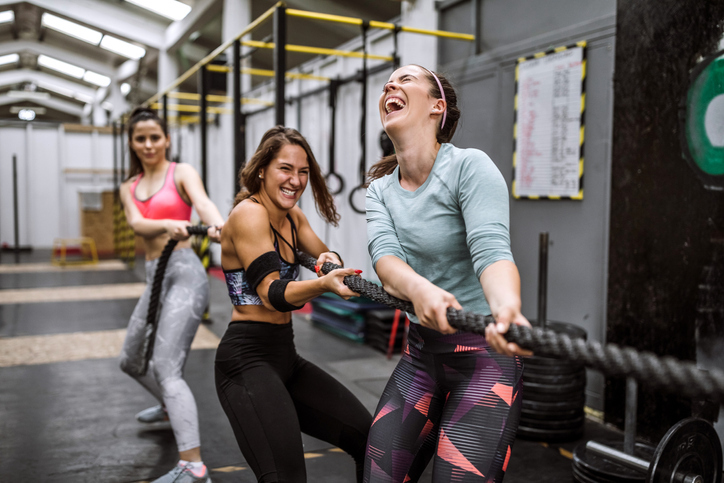 Unfortunately, the best laid plans get disrupted by life events – increased work, family stress, illness – any of which can put a wedge between continuing your workout regimen or scaling back your exercise routine by quite a bit. There will always be things we can’t control but beware of roadblocks hampering your efforts to get in shape. Below are listed some reasons why many, who are just beginning an exercise program, often fail at keeping up with the demands of working out. But more importantly, what you can do to avoid the pitfalls so your exercise program can remain alive and well throughout the year and beyond. We’ve seen this person before in the gym – they want to get back into shape and they are going all out, at a gung-ho pace far beyond what they are capable of just yet. In other words, they think they are in better shape instead of facing the facts that they haven’t worked out in quite some time. What usually happens is they burn out quickly due to overly sore muscles, possible sprains or strains and wearing themselves out right from the get go. Maybe you were a star athlete back in high school but high school was a couple of decades ago. Your body has changed since high school days and you need to respect and treat it as such. Start off easy. If it has been more than three months since you last worked out regularly your endurance and strength will have taken a hit. Take time to gradually build back up to avoid injury making workouts easier initially. Three days a week is often a good start of moderate cardio for 20-30 minutes and 1-2 days of strength training. Once your body has gotten stronger, you add more days, minutes and routines. Be sure to listen to your body and if you are experiencing severe soreness, take a couple of days off and begin again slowly easing into your workouts. It’s not to say you always look forward to getting hot and sweaty but you should at least have a shot of endorphins being released so that by the end of the workout you are feeling good. However, if your best friend has decided to take up running and wants you to join in but the only problem is you hate running, you’re most likely not going to stick with it. Everyone is different when it comes to what they like to do to get in shape. The important thing is to figure out what it is you like to do. If you like to socialize try out a group aerobics class, or a walking or running club, a yoga session or find a workout buddy. If you get bored easily try out circuit training or some type of a bootcamp workout. If you want more of a challenge go for high intensity interval training or train for a marathon. If structured exercise is not you try instead playing a variety of sports such as tennis or basketball. Work in exercise throughout your day by running up and down a staircase when doing chores, add in squats, lunges or work extra hard when gardening or raking leaves. No one likes to work out when they are feeling pain. If pain crops up, your exercise routine will most likely drop off fast and can be hard to start up again down the road. From back injuries to arthritis to shin splints, pain can lead to being fearful of exercise with concerns of making things worse. If you have been having pain for more than a few days and is getting worse, go see your doctor. Get a diagnosis of what is causing the pain as you don’t want to make the situation any worse. The doctor will either refer you to a physical therapist or give ideas of movements that are safe and can keep you still moving. If at any time you experience sharp pain in the joints, swelling, pulled muscles or pain that far worse than what it should be, listen to your body. Stop the exercise and take a day or two of rest to assess how you are feeling. It sounds simple according to the recommendations for being physically active – workout at least a 150 minutes or 30 minutes, 5 days a week. The problem is many of us barely have time to fix a meal let alone find time to work out. Over time, what started as a good thing is now becoming harder to find the time to do so. Be realistic. There will be some weeks getting in the recommended amount of exercise is easy and others weeks it will be impossible. On some days you will feel energetic and then the next day not so much. Take the time to actually schedule in exercise. Just like you schedule in a meeting for work you can do the same for your workout. The night before, prepare by laying our your gym clothes, setting you alarm of when to get up and make it easy on yourself so you have few if any excuses not to workout. Remember, even if you don’t get in a full 30 minutes or more each day of exercise, 10 minutes is better than none. Give yourself a pat on the back for that and there is always another day to strive to get in more.